Take your existing network infrastructure skills to new levels allowing you to successfully control and deliver major infrastructure projects. The Certified Network Infrastructure Technician (CNIT®) program is a comprehensive program perfect for those with at least 4 years of verifiable experience within the network infrastructure sector, or relevant qualifications and certifications in a wider project environment. The five-day program aims to develop the knowledge and skills required to perform the multifaceted role in delivering complex project to site. Learners will greatly enhance their supervisory and management skills through a series of complex case studies mastering the knowledge and understanding required to interpret complex design documentation, the need to establish effective relationships and communications with principle stakeholders and managing the end to end project implementation cycle. They will develop an aptitude for logistics and resource management, including team health and safety, dealing with risks and issues that impact project delivery. A certified CNIT® will be undaunted when dealing with escalations and problem resolution within a strategic network infrastructure project. The CNIT® also takes into account the requirements of the current BS EN, TIA and ISO standards, whilst also meeting the architectural and technical requirements. During the program learners will also have access to current standards for reference purposes. The impact to the project delivery of current and emerging networking technologies will also be explored including wireless access, security systems and VOIP. Learners will gain an in-depth knowledge of technical parameters for cable testing and will demonstrate confidence when dealing with escalations from installers undertaking cable testing. Learners will also gain experience in the management of test records using cloud-based applications, from the cable test through to the delivery of warranty certificates to the customer. On successful completion learners can demonstrate the highest levels of knowledge, competency and confidence in supervising the delivering complex infrastructure projects, demonstrating efficiencies in both time and cost, coupled with a focus on quality and accuracy in order to achieve project closure on time and within budget. A CNIT® can also feel confident that they are progressing through The Global Network Infrastructure Education Framework. They also gain an internationally recognised BTEC Level 4 Professional qualification and official CNIT® certification. This certification enters the learner into a commitment to life-long learning and offers the perfect portal to ensure knowledge; skills and certification remain current and up-to-date. Each certification gained from CNet Training requires re-certifying every three years. The process is simple, cost effective and easy via an online learning management system allowing knowledge to be brought up-to-date to reflect the very latest changes and technical developments. Re-certified learners can also benefit from utilising the latest program material, can continue to use the CNIT® logo and post nominal letters for the next three years. This program is designed for those wishing to extend their knowledge, skills, qualifications and certifications into a wider and more complex project environment with emphasis on enhancing supervisory, leadership and management skills. 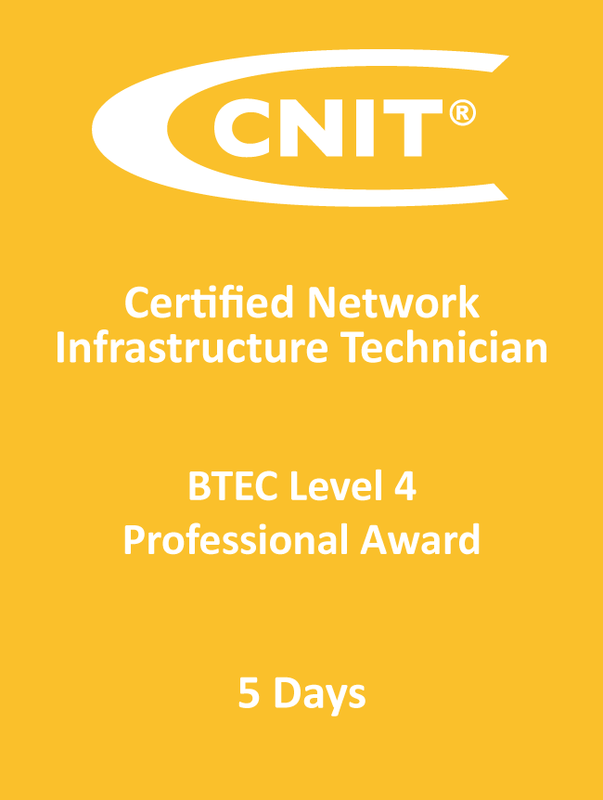 The Certified Network Infrastructure Technician (CNIT®) training program is 5 days in duration. At least four years of verifiable experience within the network infrastructure sector or relevant qualifications. Successful completion of the Certified Network Cable Installer (CNCI®) program would be an advantage. Successful learners will have the added supervisory and management skills, knowledge and competency to confidently deliver complex infrastructure projects within site environments.